Planting shrubs is a great and easy way to add variety, shade, and privacy to your garden. Shrubs, or brushes, as you might know them as well, are basically the category of plants that come in between flowers/grass and trees. Shrubs are wooded plants, typically middle in height (though there are small ones and varieties that grow up tree-like as well), and can -but not always have to- be evergreens. Shrubs have a large number of uses in landscaping, and can be utilised for everything from decorative planting and backdrops, boarder definition, and adding colour to your garden, to being used as privacy hedges. With a wide range of colours both in foliage and flowers, and the possibility to cut and clip them into pleasing shapes (and even sculptures if that’s something you fancy), shrubs offer a lot of visual pleasure. And -best of all- some shrubs are edible, or produce edible fruits, as well. In other words: if you have a garden, planting shrubs is one of the best ways to create diversity and stunning looks that can greatly enhance your enjoyment of the spot of nature that’s all yours. 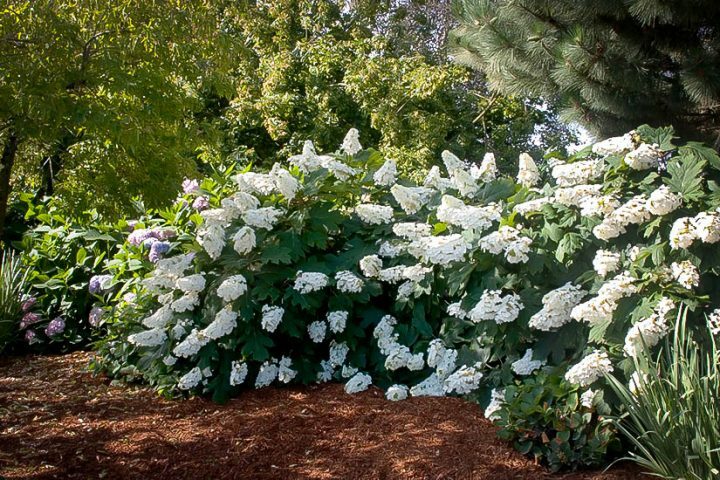 Below, we have collected some of the most popular shrubs available. We’re sure, you’ll find quite a few that will look perfect in your yard! It’s not pure chance that has Witch Hazel at the top position of our collection – it makes sense to put it here since this shrub is (usually) the first to bloom in a garden. 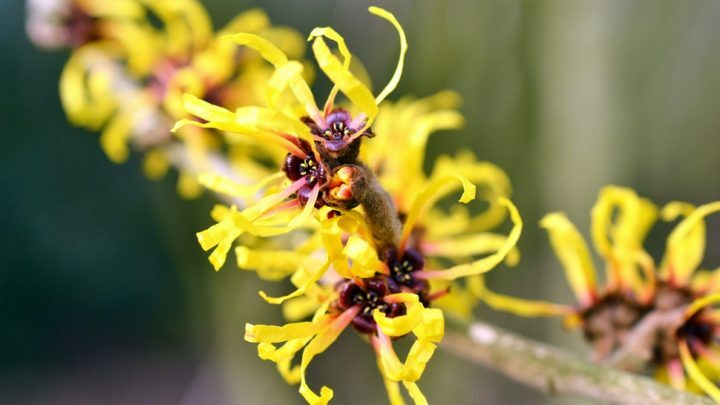 The Witch Hazel looks more like a tree than a typical shrub, but in late February or early March, when it ushers in spring with its lovely flowers, it does reveal its true ancestry in stunning beauty. 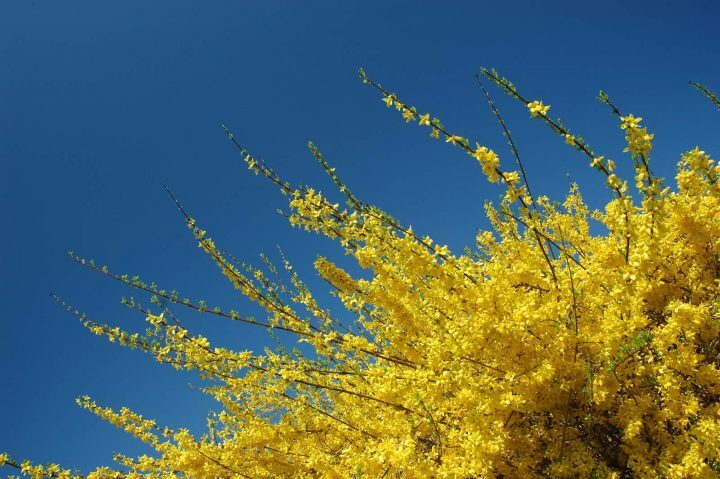 When first planting it, it might be a good idea to consider its surroundings, since the bright yellow blooms look especially beautiful against a darker backdrop. Evergreens, for example, make for wonderful planting companions. Blooming just shortly after the Witch Hazel, the Forsythia is one of the more commonly planted bushes. This beautiful bush grows lovely yellow spring flowers, and is particularly useful for screening purposes, and can also be grown as hedges. With one of the most fragrant flowers, lilacs have been a staple shrub in gardens for a long time. You may be most familiar with the lilac-coloured blooms of the common lilac, but there are white and yellow varieties available as well. 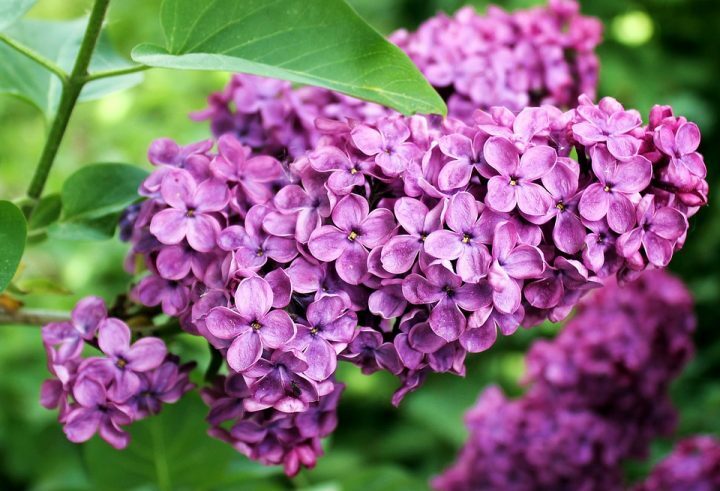 Since lilac shrubs have rather compact forms, but can also grow quite tall, these plants are suitable both for standing alone as focal point, and being planted in groups for shading and screening purposes. 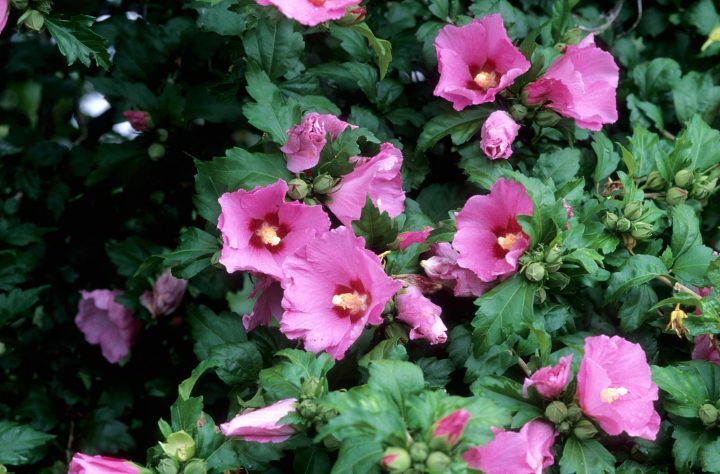 Rose of Sharon shrubs are a lovely type of late summer-blooming bushes and can be used to bridge the time of year when most flowers have wilted already, but the beautiful fall colours are still a few weeks away. With a lot of colours, including pink, purple, white, and even blue(-ish), Rose of Sharon shrubs are a good fit for (nearly) all colour schemes, and can be used as screening plants when grouped together along property lines. When used as hedges, however, you might need to plan in semi-regular pruning (one or two times per year should suffice in most cases) in order to prevent them from looking untamed. 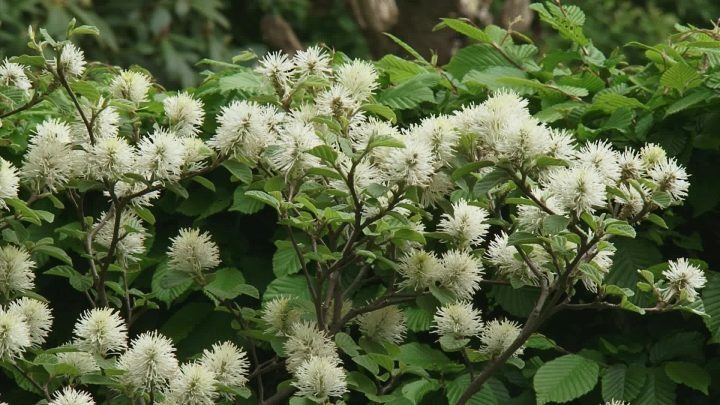 The Fothergilla bush is one that brings joy and beauty to your garden not once, but two times a year: in spring, its rather unique flowers remind you of bottle brushes or feathers, and in fall, this brush puts on a stunning autumn-colours display with its foliage. Their main flowering season in summer shows their beautiful flowers; during the autumn months, its leaves turn the most beautiful fall colours, and even during the bleak winter months, the Oakleaf’s peeling bark captures the eye. But it’s not just the Oakleaf, but Hydrageas in general that make for beautiful garden shrubs. Their flowers come in a wide variety of colours, and due to their blooming time, those shrubs are the perfect way to bridge the time between spring-bloomers and the colour-explosion of fall. Somehow the Red Twig Dogwood outdoes even the Oakleaf Hydragea in terms of visual interest. 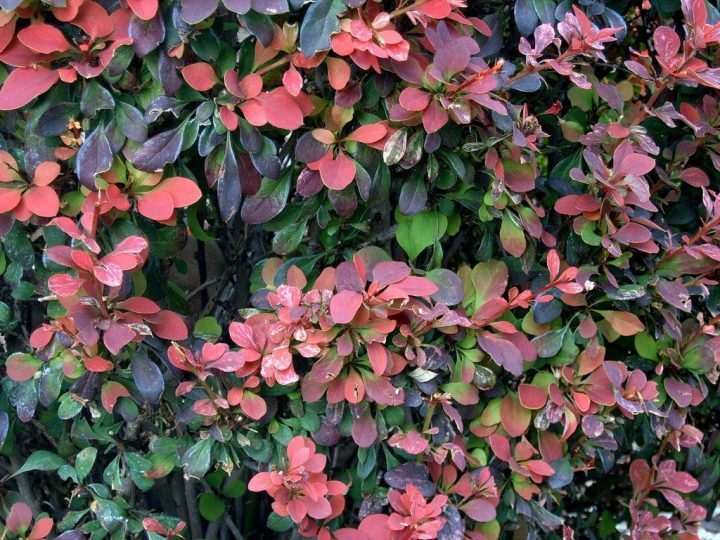 This bush boasts lovely blossoms in spring, unique two-toned leaves in summer, and berries during summer and fall. 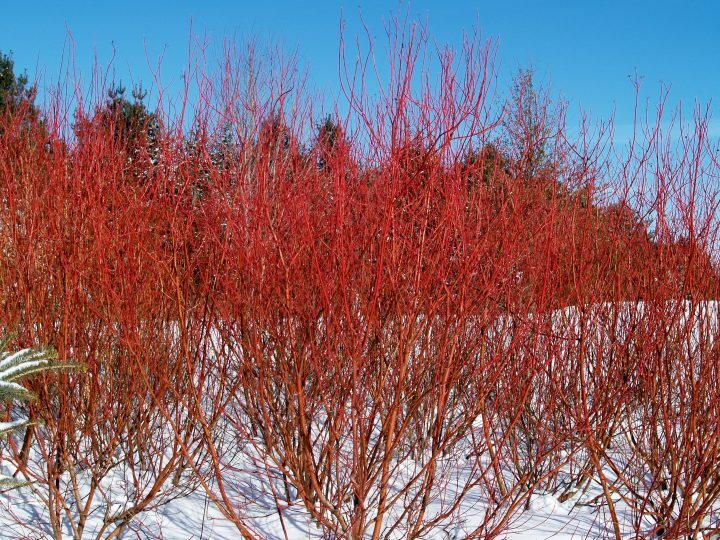 And on top of that, there’s the feature that gives this shrub its name, and which is (often) the main reason for growing it: during winter, the plants bright red twigs are at their most visible. 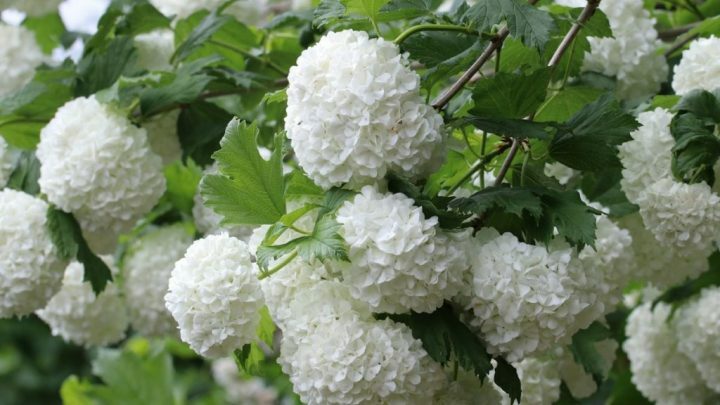 The Viburnum shrub with its easily recognisable white, snowball-like flowers is most often used in foundation plantings or mixed borders, and impresses with its intense, sweet scent of cloves. 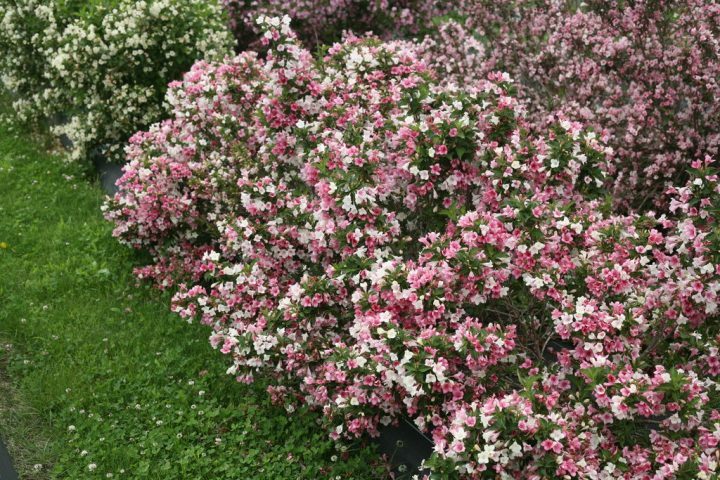 Used typically in informal gardens, or planted in groups for hedges, Weigela shrubs stun with their profuse, sometimes multi-colured blooms throughout spring and fall. In terms of scent and beauty of blooms, hardly anything can quite compete with roses. While roses often have a reputation of being hard to grow, there are many varieties that do well in almost any type of environment, making them a much-coveted and often-used type of shrub. Hollies are, without a doubt, the most widely known evergreens, so they more than deserve the top spot in this section. As we certainly don’t need to tell you, holly shrubs are at their most beautiful in the winter time, when they festoon your garden with their bright right berries. But they offer a lot of beauty in the other seasons as well – with their dark green foliage all year round, and gorgeous white flowers in summer, they enhance every garden at all times. 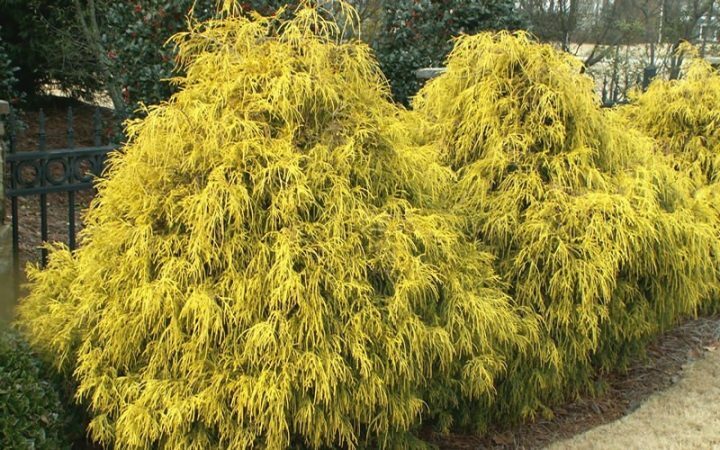 Both King’s Gold and Gold Mops are popular types of false cypresses, and captivate with their lovely golden foliage. These shrubs are perfect for planting them in combination with darker plants (whether it’s dark, deep purple flowers, or dark leaves), to create highly attractive colour schemes in your yard. 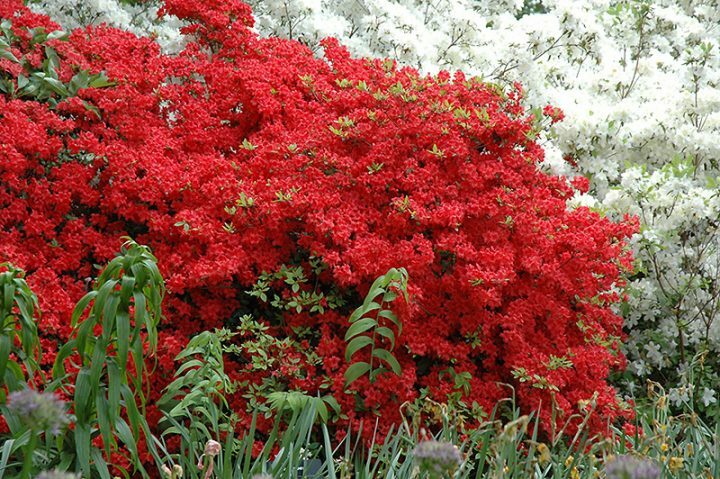 The Stewartstonian Azalea is, as the name suggests, an evergreen type of azalea. This plant offers year round interest, and is especially lovely in fall with its red fall foliage, and in spring with its even brighter red flowers. Boxwoods are compact and versatile evergreen shrubs that can find a good spot in any garden – and an even better reason for being there. 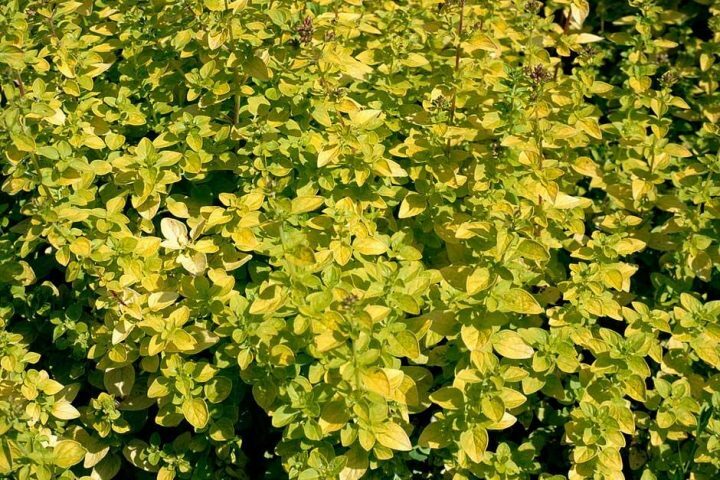 The shrub is covered with tiny, oval leaves, grows up to 20 feet tall, flourishes as well in the sun, as it does in shady spots, and is particularly receptive to being shorn or clipped. 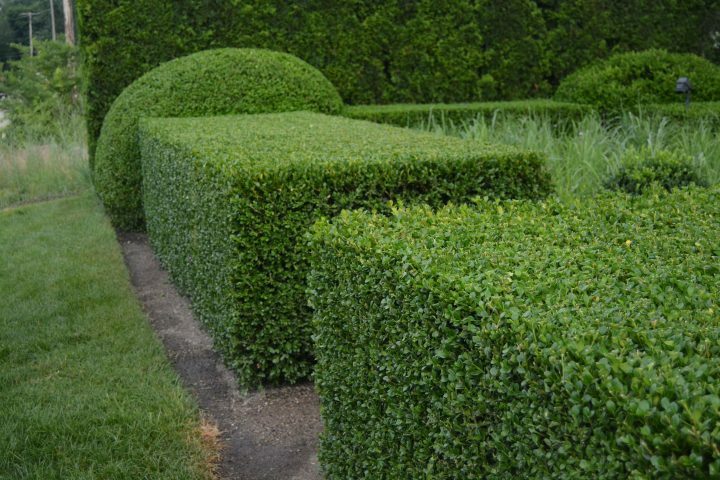 This, then, means that boxwoods are the perfect choices for foundation planting, edging flower beds, creating walled gardens, thick privacy hedges, as well as topiary (if that’s your style). Winter Box, or Sweet Box, is closely related to the common boxwood, but has highly scented winter flowers that give the plant its common name(s). Yes, we did say winter flowers. And to make matters even more different than nearly all other plants, the Sweet Box boasts lovely red, black, or purple berries during the summer months! The Juniper shrub (in its low-growing variety) is the most commonly used shrub when it comes to filling in empty spaces between other, larger bushes, or trees. 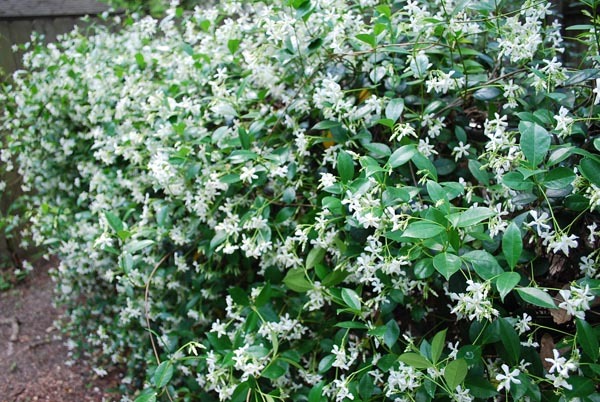 Jasmine shrubs are very popular and come both as semi-evergreens and true evergreens. 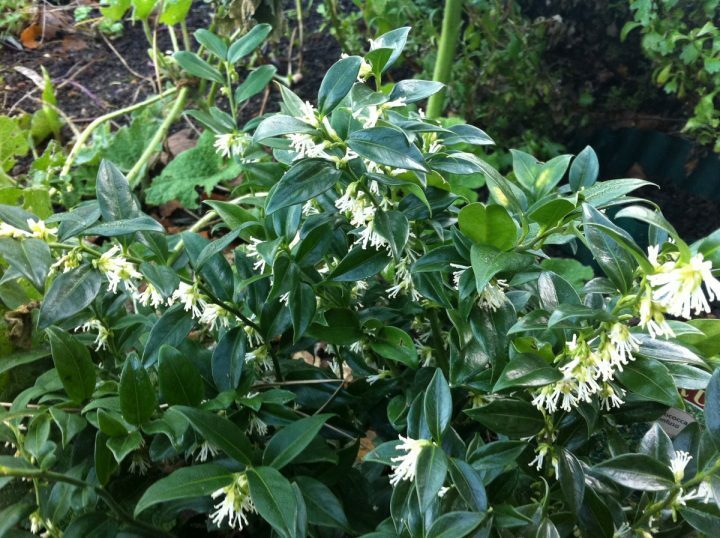 Most Jasmines are summer flowering and produce light-coloured, scented flowers (which you probably know). The Winter Jasmine is (yes, you guessed it!) a variety of the Jasminum genus that has lovely yellow flowers in winter. 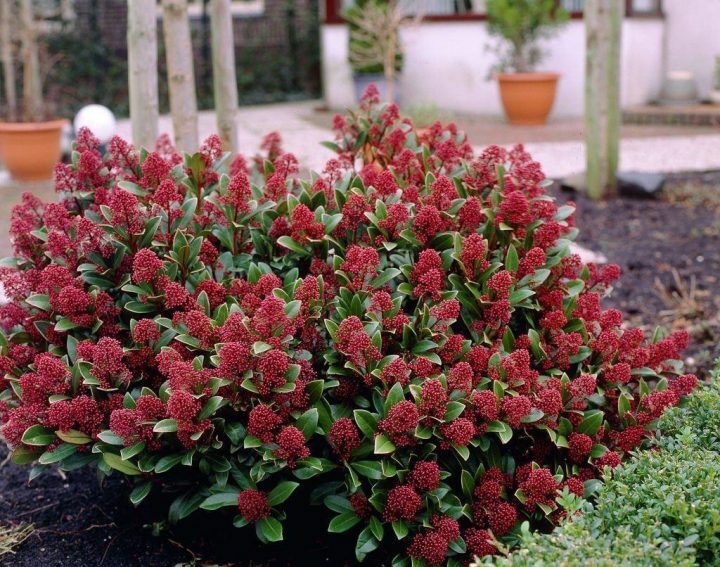 The Skimmia shrub is a lovely plant that impresses with large white-yellow flowers in April and May, and grows hardy, lasting berries in the winter months. Most varieties are either male or female, so you need to make sure to grow at least one plant of each, so that the female plants can produce their red berries! There are some hermaphrodite varieties that can self-fertilise, but even those plants will produce more berries if a “true” male plant is grown somewhere nearby. 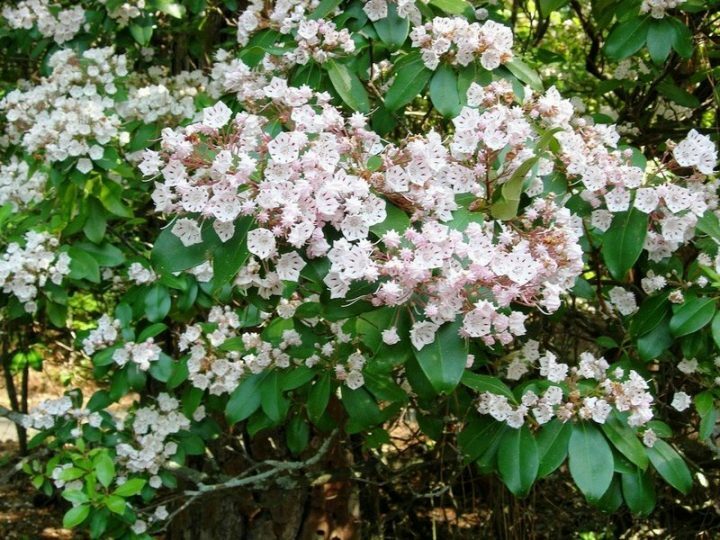 The Mountain Laurel is a particularly beautiful plant for borders and/or foundation planting, and looks just stunning when planted in large quantities. Mountain Laurels are multi-stemmed shrubs with glossy, green leaves, and bear colourful, unique-looking cup-shaped five-sided flowers in late spring and early summer. 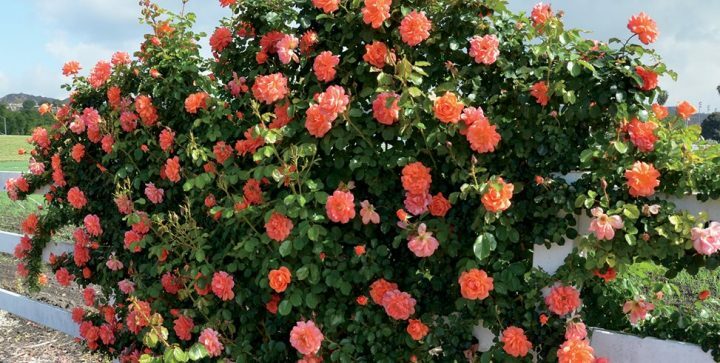 A particular plus for this plant is the fact that older bushes oftentimes have particularly gnarled branches, which lends a special character to the bush itself, and your garden in general. Yuccas come in a wealth of different species, which, too, come with a lot of different characteristics. Some of the plants that have lovely sword-shaped leaves and creamy-white flowers in late summer and autumn, are hardier and therefore better suited for being planted outdoors, while others are not weather-resistant at all and should only be used indoors. Make sure you pick one of the sturdy varieties (e.g. 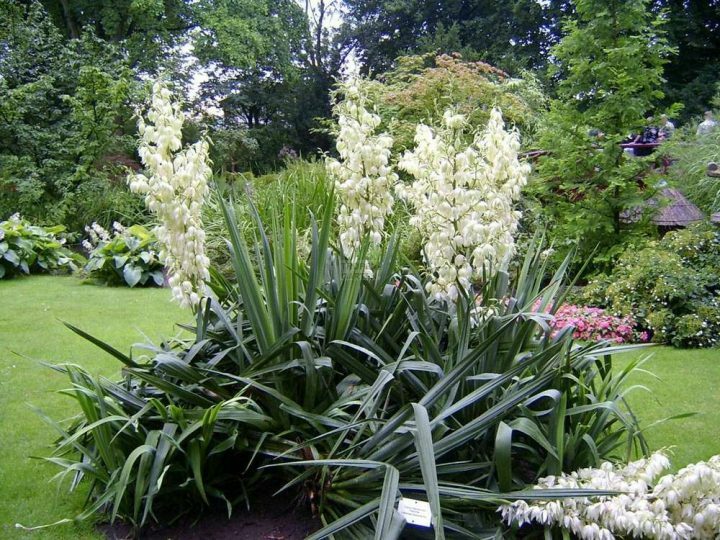 Yucca Filamentosa, Yucca Flaccida or Yucca Gloriosa) when going shopping for your garden! 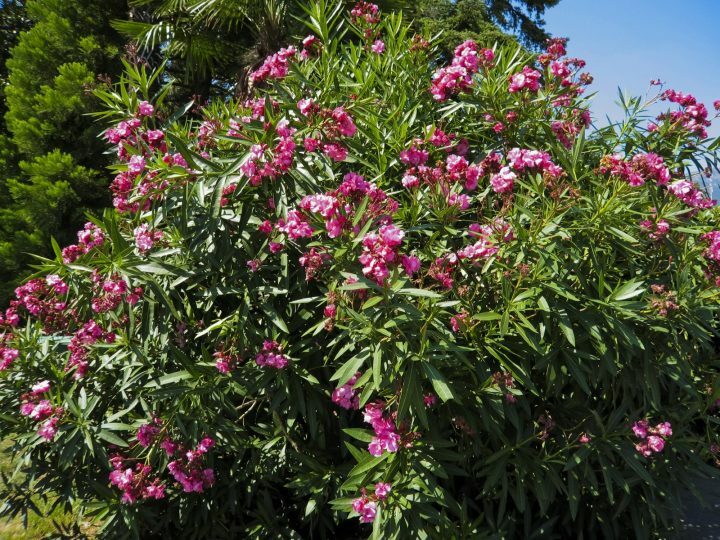 The Oleander is a plant that tolerates heat, drought, salt, and takes any soil. Literally the only thing it just can’t do is frost. Should you live in a climate where temperatures fall below 0°C/32°F, but still want this shrub in your garden, we suggest making sure you have a convenient frost-free storage on hand and grow it in a planter. Oleander has narrow, light-green leaves spread out among the thin branches, which in turn are tipped with colourful (typically rose to pink) flowers all season. The Hazel is a large, fast growing shrub (it can actually grow up to 20 meters/65 feet in the right circumstances), and has large, mid-green leaves. 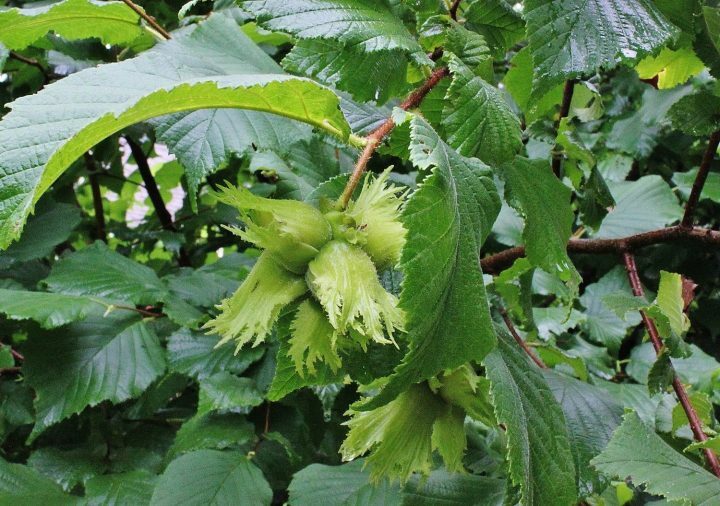 The hazel is very attractive in spring, when the male plants sport large, pale-yellow catkins, and shows its edible in autumn, when a wealth of yummy hazelnuts are waiting to be harvested. Hazel shrubs are perfect to plant as hedges, but be aware that hazel pollen is one of the biggest allergen sources in late winter and early spring! You might want to make sure neither your family or neighbours are sensitive to this plant before heading to your local garden center! Elders are commonly known as woodland or wild area shrubs, but they do offer a lot of interest for intentionally planting them in your garden. 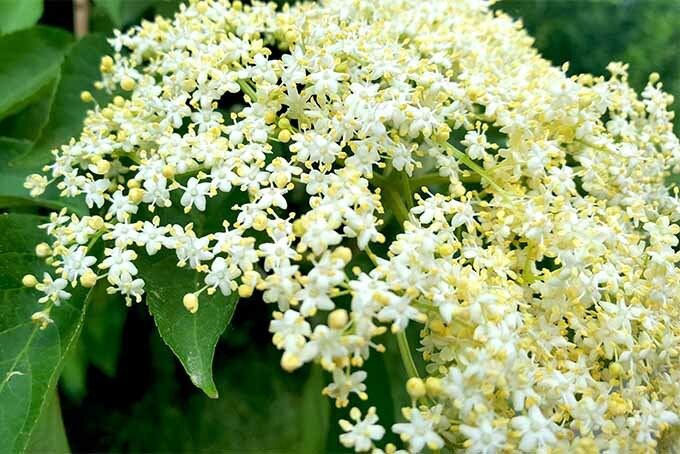 The Elder shrub impresses with beautiful, fragrant flowers in spring (which are edible, and for example a perfect choice for making syrup! ), and lovely, delicious dark purple or black berries later in the year, which are usually a bit bitter and should not be eaten raw, but are a perfect choice when you want to produce jam or even wine. 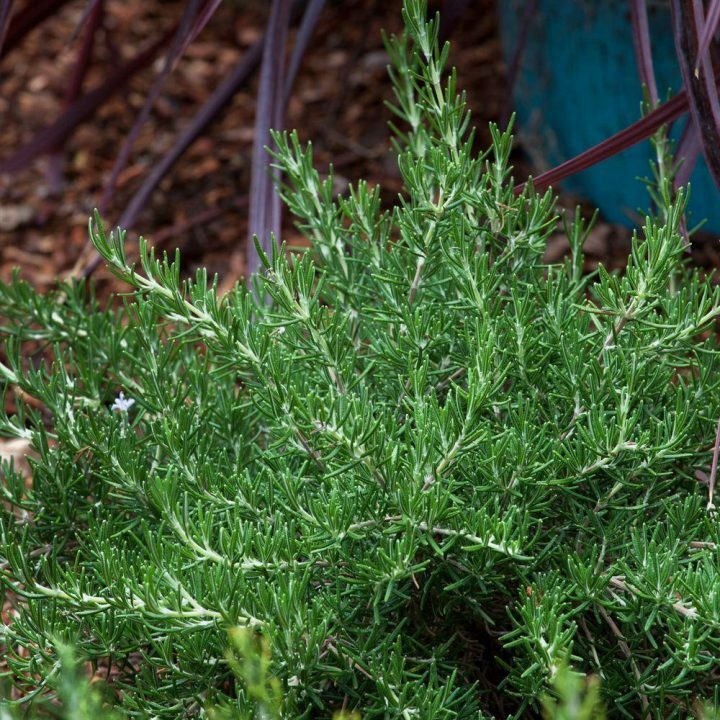 Often thought as a herb, Rosemary actually is a very attractive evergreen shrub that boasts edible, aromatic green leaves all year long, and impresses with beautiful blue flowers in spring and early summer. Rosemary plants are the perfect choice for beds and borders, Mediterranean- or kitchen gardens, and also do very well when grown in containers. Sage is another herb that is actually a shrub, and offers a lot more than “just” their use as one of the most sought after ingredients in a wealth of meat and veggie dishes. 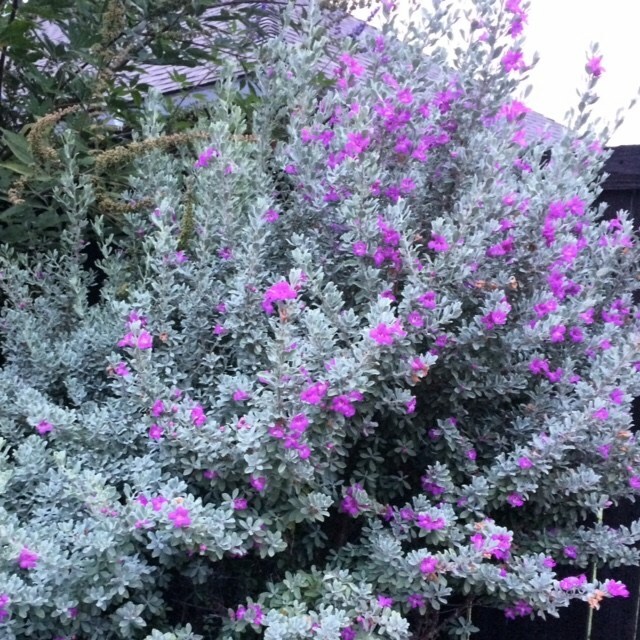 In gardens, Sage plants are a great choice for beds and borders, and impress with a mass of purple flowers in summer, and otherwise have a distinctive grey-green foliage. Thyme shrubs are colourful, ornamental plants that would deserve their place in any garden even without their undeniable appeal as cooking ingredient. Thyme plants are typically low-growing and can be perfectly used to fill in gaps within other, larger bushes or trees. Try planting thyme shrubs in the vicinity of windows or patio door to fully benefit from the very aromatic foliage, and make sure you have a good view to appreciate its many colourful flowers! While we do know that Marjoram and Oregano are two very different plants, we still chuck them into a single category. Not only are both shrubs versatile, sought-after, and -really- essential herbs in about all of our favourite comfort foods, they also are particularly attractive garden plants that delight with their lovely flowers and golden coloured leaves. A relative of rhododendron and azalea, Blueberry shrubs impress with creamy-white spring-flowers, plump and juicy berries in summer, and a wonderful scarlet foliage in fall. 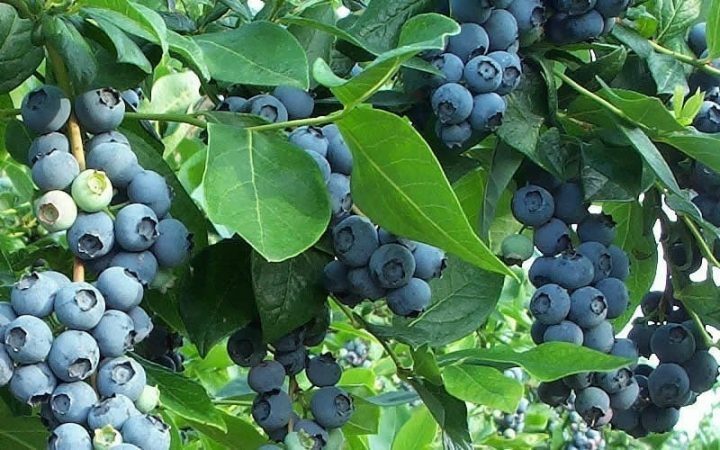 Blueberry bushes are particularly easy to grow since they are resistant to most diseases and pests, and can easily produce fruit for 20 years or more. Since there are quite a few varieties available, we’re sure you can easily find the perfect choice in terms of cold hardiness to suit your climate. Lingonberries are known as tyttebær in Norwegian and Danish, rauðber in Icelandic, puolukka in Finnish, and lingon in Swedish, and are the Scandinavian equivalent to American wild blackberries. As the fact that there are quite a few Nordic names for this shrub suggests, this plant is particularly apt to withstand cold winters. 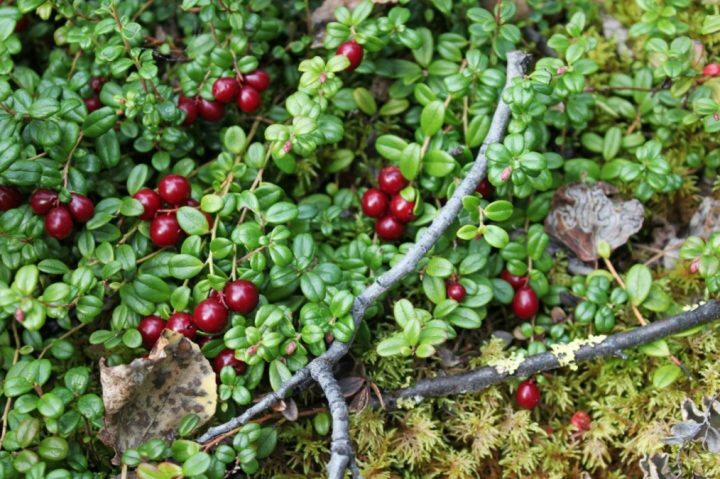 In fact, the Lingonberry shrub is a plant that does flourish in colder climates, but neither grows well, nor reliably survives the summers in warmer, or hot climates. Lingonberry plants are evergreens with dark green leaves, which are handsomely tinged red while when they are still young. The bright red berry that is ready for harvest in fall is a distant cousin of the cranberry and shares it slightly tart, sour taste. The fruit itself is wonderfully suited for making jams, jellies, and syrups – really anything that requires adding a bunch of sugar in its preparation. Bamboo has become a go-to staple in modern gardens these days. And for good reason! 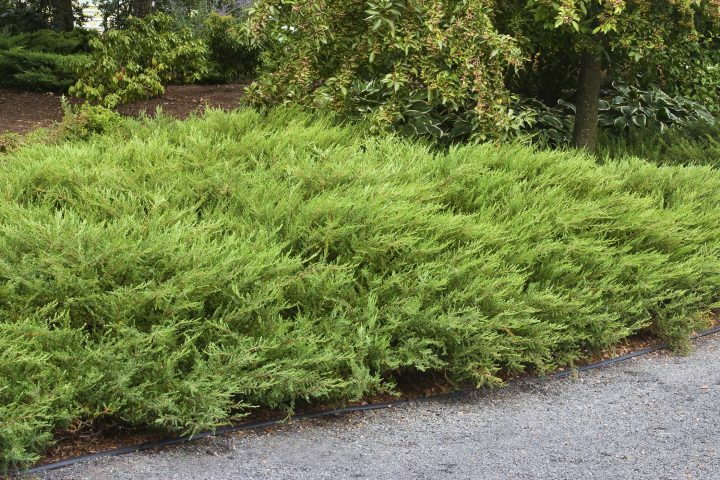 These shrubs are great when used as backdrop plants, where their elegant canes and light green foliage perfectly frame more “exciting” plants, and they also work wonderful when planted as hedging and screening measures. 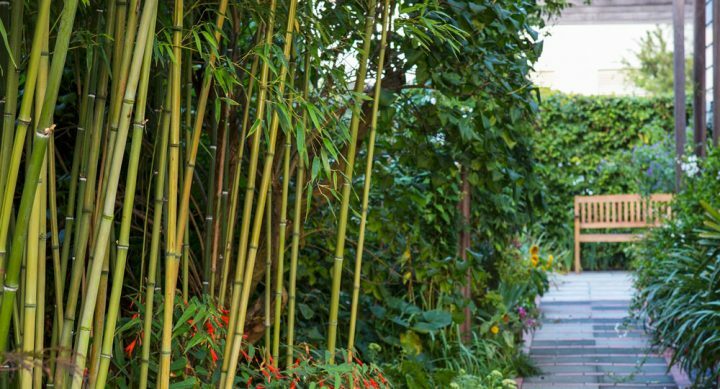 Additionally, bamboo comes in a wealth of different types, so you have free choice between low-growing varieties that are lovely for bed borders, and tall ones that look stunning even when planted as individual focal points. 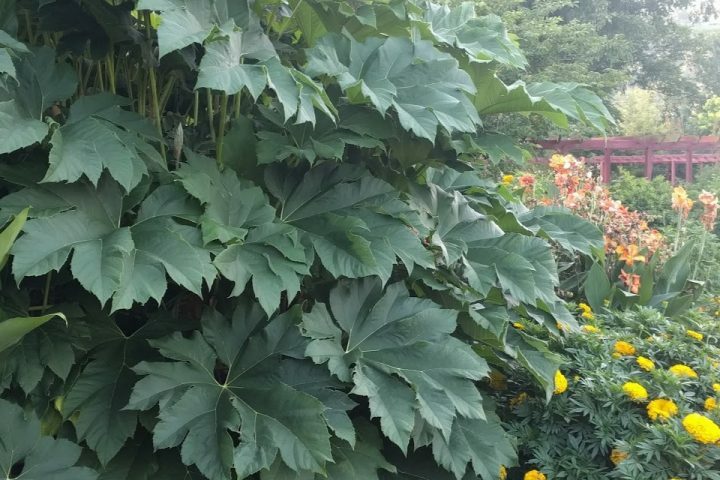 Rice Paper plants are primarily known for their large, castor bean-shaped leaves that can grow up to 2 feet across. Those large leaves are actually a sign that the stems have gone through a period of frost, so short periods of winter are actually a plus if you’re looking for enhanced shading abilities. If the plant isn’t reached by frost, but flourishes in a mild climate all year round, the leaves will be noticeably smaller, but in exchange, the shrub will grow lovely white flowers in form of wooly balls in early summer. Additionally, the shrub will grow purple, pea-sized berries if pollinated. 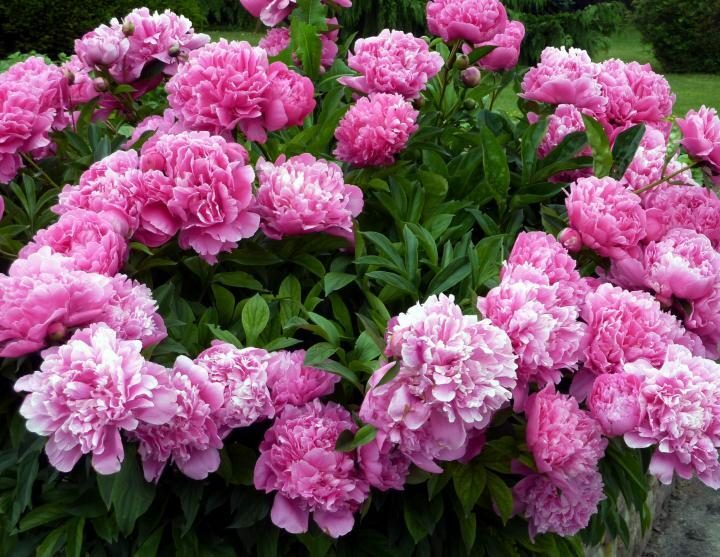 Peonies are famous for their brilliantly coloured, big blossoms that grow in various shades of whites, pink, and red in late spring and early summer. These shrubs are often highly scented, and their blossoms make for wonderful cut flowers, too. Hisbiscus, in general, are very showy plants that produce large flowers. And the Hardy Hibiscus is the king in this category! 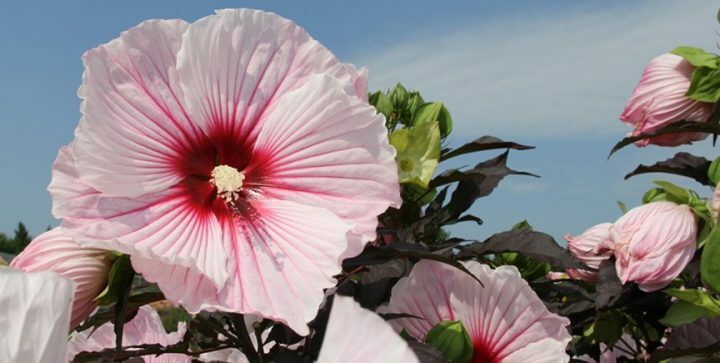 Hardy Hibiscus plants also have the nickname “dinner-plate hibiscus”, and for a good reason – they grow the largest blossoms found on hardy plants in northern climates, and thus are a real looker in your garden. This type of shrub is very easy to grow since it doesn’t need much looking after, provided they get plenty of light. 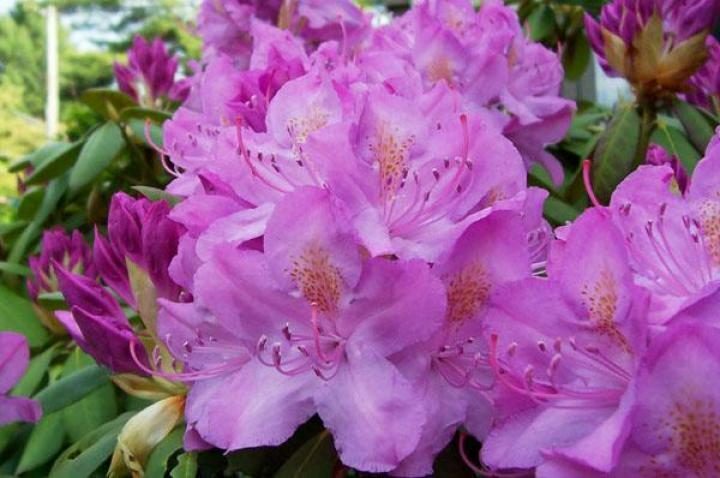 While Azaleas and Rhododendrons have their differences, they do come from the same family and we have therefore put them into the same category. Both bushes come with a multitude of different colours to choose from, and their beautiful flowers are always a sight to behold in spring. Ususally, both Azaleas and Rhododendrons do have a short-lived blooming cycle, but fortunately they provide visual interest throughout the year, not at least thanks to their stunning display of autumn foliage. Both types of shrubs are perfect for foundation planting and borders, and look especially great in woodland gardens. You might think that a shrub that does not grow (showy) blooms has very little value to add to a garden, but you’re wrong there – and the Barberry shrub proves this spectacularly! Not only does this plant have lovely thick, green leaves that turn a great shade of red in the fall, but it also grows numerous berries as well. But that’s not all. What’s the most special about the Barberry shrub is the fact that they grow in beautiful shades of green, yellow, and rich burgundy and thereby add colour to your garden all year round. 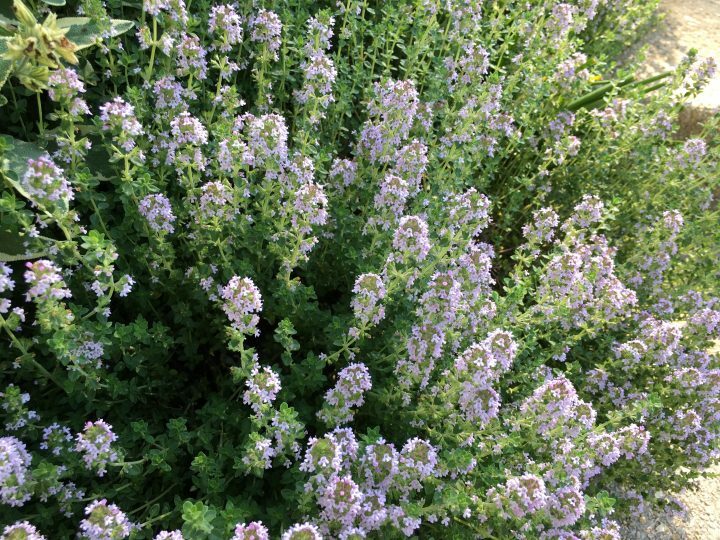 The Lavender shrub is one of those types of plants that should be found in any garden, if you ask us. Not only does this evergreen shrub look great with their silvery or green-grey leaves, but it produces spikes of supremely fragrant, lilac flowers throughout the summer months. The cut fragrant flowers are great to decorate cakes or salads, if you like the taste you can make candy out of it, and they are a great way to scent cupboards (just tie them together and put them on a hanger, or put them in a small cloth bag and stuff it between your folded clothes). 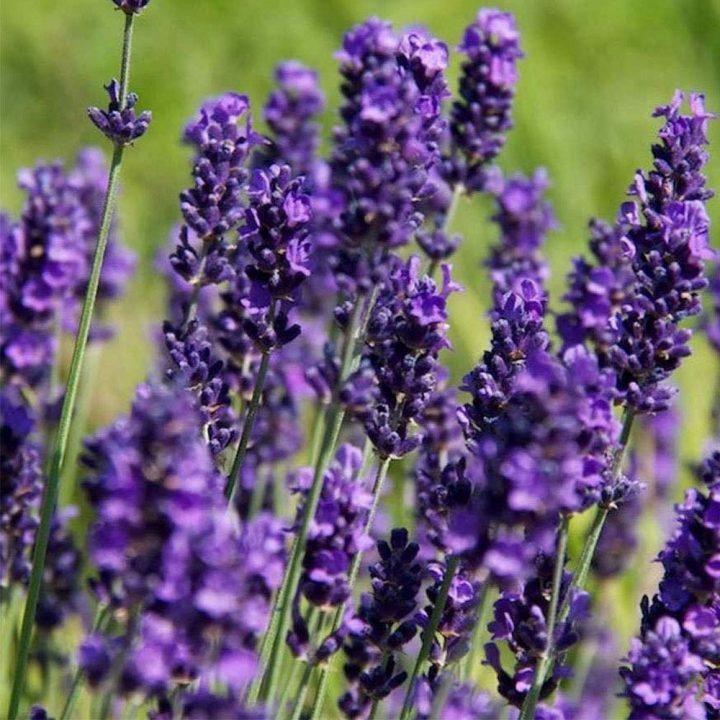 And what’s best about lavender: those shrubs do not only attract a myriad of bees and butterflies to your garden, they are also supremely easy to grow – once planted, they are very hard to kill, even if you just ignore them for years.